SoftPlanet makes it possible for everyone to get free CrossDJ download directly from our servers. There is no registration needed for downloading. CrossDJ Free 3.0.1 is a freeware audio mixing software, designed to enable you to act like a professional DJ right at home. It comes with virtual decks and lots of effects, transitions, etc. It seems to be a proper first step. Basically, you get free software, which enables you to act like a pro. 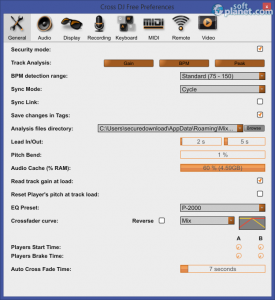 CrossDJ Free is one of the software solutions, developed by professionals for professionals. 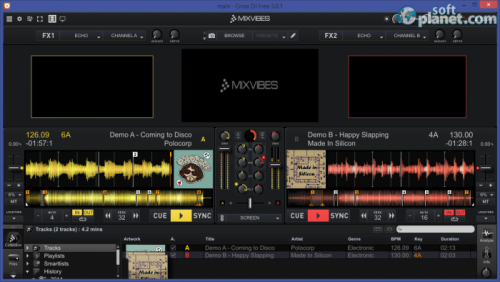 Since Mix Vibes has been creating professional DJ software for 15 years, we expect this software to be really top notch. “Surprisingly” it is. Basically, you get 2 virtual decks, more than 30 video transitions, a mixer, etc. 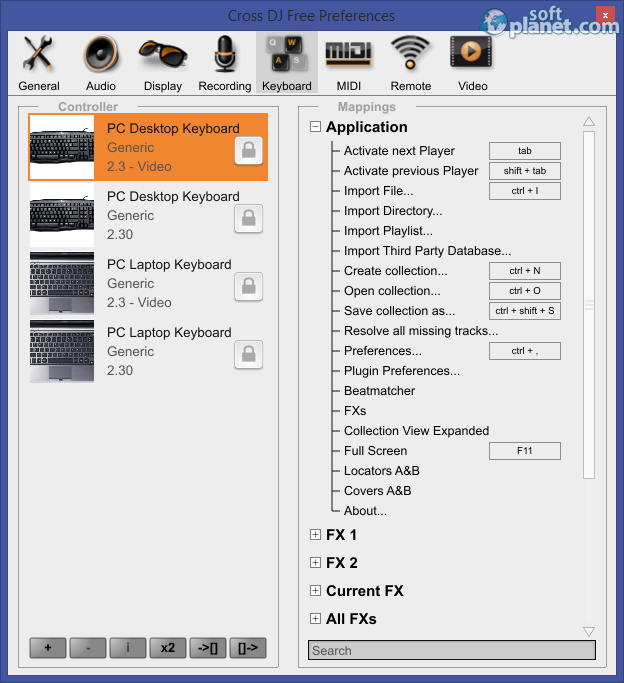 In addition, CrossDJ Free fully supports iOS remote and iTunes. 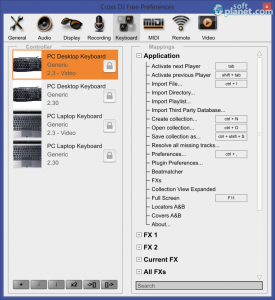 Even at first sight, you can say that CrossDJ Free 3 is a professional application. Its layout is very stylish and well-organized in order to provide you with quick access to all available features. Its color scheme is well-balanced. You are able to change the color of waveforms. Actually, you can choose between Legacy, Spectrum and Nexus. 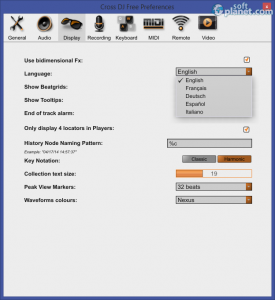 In addition, CrossDJ Free 3.0 is fully globalized in five different languages – English, French, German, Spanish and Italian. If you have any experience with such software, you will find out Cross DJ Free to be very intuitive and user-friendly. However even if you don't have experience, this software is probably the best alternative to start with, especially if you want to get used to the entire DJ workflow or at least the basics. In addition, it turned out that this software supports a wide range of audio and video formats such as WAV, AIF, MP3, AAC, FLAC, OGG, MP4, AVI, MPG, MKV, VOB, FLV, MOV, WMV, etc. 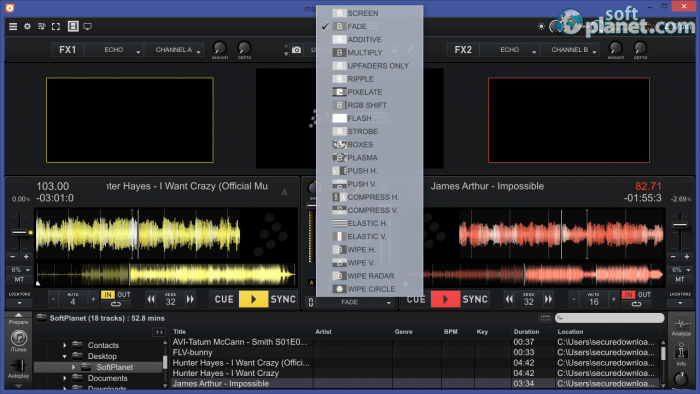 CrossDJ Free 3.0.1 seems to be the ultimate choice, when it comes to making the first step in the DJ business. Since it is free of charge you can start practicing right away. Please feel free to share your opinion with us. Why not some of your projects as well? Our security scan shows that CrossDJ is clean from viruses. The current version of CrossDJ has been scanned by our system, which contains 46 different anti-virus algorithms. That ensures that CrossDJ Free 3.0.1 is 100% safe for your computer.